Kestrel brings together much of Aquila’s speed with Formula Trisled’s reliability and serviceability, making for a sustainable and competitive racing package. Kestrel suits riders ranging from inexperienced through to ultra competitive. Running gear is compatible with most Trisled models, making this a good upgrade choice for teams that are ready to retire their previous racing vehicle. Kestrel also features full chromoly roll bars and a drop-on fibreglass body which is easier to disassemble for training or rebuilding. All Trisled racing vehicles are built at our factory on the Mornington Peninsula by people who race HPVs. New models are tested by our racing team for 6-12 months before we release them to ensure reliability, durability and performance. 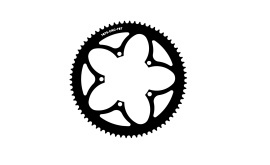 IMPORTANT INFORMATION Kestrel is a racing HPV and is not suitable for road use. Scrutineering requirements for this vehicle differ between races and are subject to change. 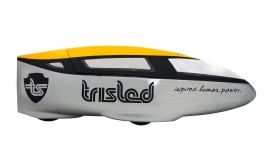 While Trisled makes every effort to ensure that our racing models are compliant with Australian HPV racing regulations, we cannot guarantee that our machines will meet scrutineering requirements. A Kestrel conversion kit is available for Formula Trisled, FastBack and FB10 owners who want to upgrade their current vehicle. There is a reasonable amount of work in fitting this conversion kit and some special tools and skills are required. Please discuss this with a Trisled Staff member to assess suitability for your team. The Kestrel shell is also available separately through our online store.